Getting New Shoes, Guys? Turn To Chuck. When walking to class, you probably do much the same thing as I do. You look at people’s feet. With all that attention paid to feet, I thought it warranted a story that dealt seriously with the issue that we all face daily — shoes. Plus the fact that I, myself, needed new ones. Since I needed new shoes, I began to notice the different types of shoes that my fellow male students were wearing. For example, there are the classic shoe of the alternative scene, Doc Martens. I remember when I first went looking for this big-soled shoe a couple of years ago, and it was quite a task. It required a trip to The Alley in Chicago to purchase the footwear. The other main shoe that has been embraced by the hipster types is the Chuck Taylor Converse All Star, or “chucks” for short. While this shoe started out many years ago as a basketball shoe, it has now become more of a staple for walking around the campus. And the motto of many who wear these shoes is: the older looking the better. 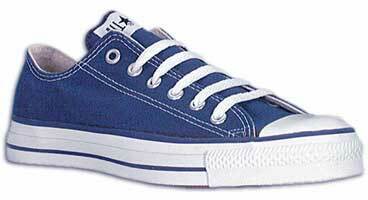 Of course, with a big campus such as our’s, comfort becomes the main criteria for any shoe. After all, who wants to wear shoes that make every step painful when you have to trek halfway across campus. Bill Olsen, junior in agriculture, said he likes Nike’s because they are so comfortable. Olsen added they provide more arch support than most athletic type shoes. As soon as the weather turns nice, many people pull out their Birkenstocks or other open-sandal type shoe and begin wearing them all over the place. Again, the primary motivation seems to be the comfort and the natural air conditioning the shoe provides. So when looking for new shoes, keep both comfort and style in mind. 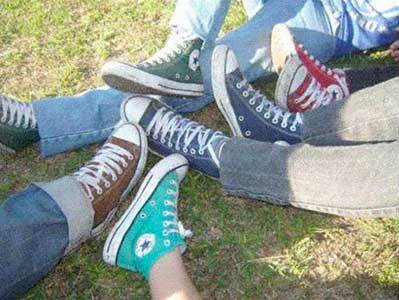 With those factors in mind, chucks seem to be your best bet. Heeding my own advice, I went out and bought a new pair to replace my current dying ones. But not one to buy the same type, I risked a new color and went for the low tops instead of the traditional high tops. All the research helped, and I hope you take it to heart before making the wrong footwear decision.